With a new car-shopping service from United Services Automobile Association, members can use an Apple iPhone application to research vehicles, apply for a loan and buy insurance from their smart phones — all while at the dealership. Dealership F&I staffers are enticing customers to buy interior and exterior vehicle protection products before they enter the finance office. It all has to do with how the products are merchandised. Take Hyundai of New Port Richey in New Port Richey, Fla., for example. The dealership gives away car-care kits -- a collection of cleaners in a large black bucket -- with the appearance products it sells. About a dozen or so of the buckets are stacked along a side wall pyramid-style in each of its five finance offices. The offices are glassed-in so customers can see the pyramids before they enter. Many customers point to the buckets and say, “I want that,” says Fred Singleton, the store's director of finance. The finance managers don't need to say a word. Appearance products are the dealership's No. 3 product sold behind extended service contracts and GAP. At least one out of four customers purchase an Auto Armor interior and exterior protection package, and 95 percent of those who do buy the premium package for $725, Singleton says. Singleton's store isn't alone in its focus on appearance products. Other dealerships see demand growing as people hang onto their cars longer and as environmental hazards such as acid rain eat away at the vehicle's finish. Video testimonials. The Suburban Collection, outside Detroit, is getting such positive feedback from customers that it's asking them tell their stories on video for posting on Suburban's Web site. Finance Director Gary Allgeier predicts the tactic will have customers come to the store asking to buy the products. Flashy demonstration. 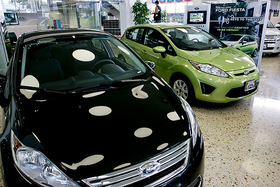 Finance managers at some dealerships briefly ignite fluid on a treated car hood or on a piece of metal. They then dip a rag in a cleaner, hand the rag to a customer and ask the customer to clean the stain so the customer can see how easily the damage wipes away. Vendors have put similar demonstrations on DVDs that dealerships can show their customers. Half-a-hood treatment.On one car in the showroom, the shop has treated half the hood and left the other half untreated. The finance manager has customers put on plastic gloves so they can feel the difference. Show-and-tell. Vendors provide dealerships swatches that allow customers to compare how treated and untreated fabric responds to various stains. Some dealerships show a large laminated board showing about 40 different stains covered under the product guarantee. Draw a picture. Finance managers draw a diagram showing how a car's finish is porous and how the protective coating smoothes out the car's surface. Promote resale value. Edward Overbeck, a partner at vendor Great Lakes Chemical Services Inc. in Kalamazoo, Mich., says one of the strongest selling points of appearance products is improved resale value when it comes time to trade in the car. The ultraclean cars fetch higher prices. In some cases, the product warranty is transferable to the next owner, which also adds value to the trade-in. Demonstrate cost savings. Laura Procida McCudden, vice president of Sundial Ltd., a Tampa distributor of appearance products, provides dealerships with documented claims for thousands of dollars as a result of exterior or interior damage that they can show customers. The pitch: having a product warranty can pay off.